Over The Last 7 Days Our Planet Has Been Violently Shaken By 144 Major Earthquakes. Why is the crust of the Earth shaking so violently all of a sudden? 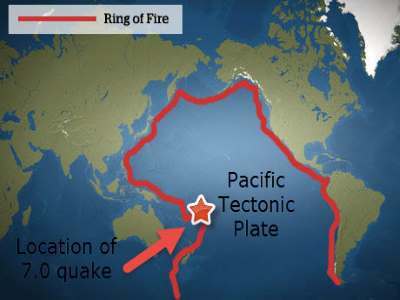 Ecuador, Japan and the US all reside on the same tectonic "Ring of Fire," which can be seen in the map above, and both Ecuador and Japan have just suffered three deadly earthquakes in rapid succession along that ring. As can be seen in the ABC News report below titled "Third Earthquake in Rapid Succession on 'Ring of Fire', we hear what the newscaster refers to as the "Eathquake Outbreak," along the ring of fire with Ecuador suffering a 7.8 magnitude earthquake and Japan being hit twice with 7.3 and 6.5 magnitude quakes followed by hundreds of aftershocks which is hampering rescue effots. Just two days ago Stefan Stanford reported on a warning from the Prime Minister of Japan, Sinzo Abe who said "we are in a race against time," as we learned that the ground in Japan was "swaying every hour," in an article titled "Predictions Of Biblical Quakes On Horizon Lead To This Alarm: 'We Are In A Race Against Time'. As can be heard in the ABC News report above, with the U.S. residing on the same tetonic "Ring of Fire," there are new concerns about "the big one hitting here," as they bring on an expert that states "We're all on the 'ring of fire,' this is a very active part of the Earth and it is a reminder that this is a hazard we face." According to the Express UK, scientists are now warning that under current conditions along the Pacific Rim we could see up to four earthquakes with magnitudes greater than 8 as they quote a seismologist of University of Colorado who believes "And if they delay, the strain accumulated during the centuries provokes more catastrophic mega earthquakes." RT reports "A total of 38 volcanoes are currently erupting around the world, making conditions ripe for seismic activity in the Pacific area." We are reminded by a link found at Steve Quayle's website the importance of being as prepared as possible, because when the "big one" hits in the U.S., it will be too late. We see that store shelves in Japan are empty as people start "panic buying" after the deadly earthquakes hit. As seen in the MSM video clip below, Shep Smith informs the public that scientists agree that the “worst natural disaster in the history of the nation” is overdue and is coming. The original article Smith reports on is at The New Yorker Magazine, which describes what scientists and FEMA are all preparing for, which is a “full-margin rupture, the magnitude will be somewhere between 8.7 and 9.2, followed by a Tsunami. • FEMA expects to coordinate search-and-rescue operations across a hundred thousand square miles and in the waters off four hundred and fifty-three miles of coastline. As for casualties: the figures I cited earlier—twenty-seven thousand injured, almost thirteen thousand dead—are based on the agency’s official planning scenario, which has the earthquake striking at 9:41 A.M. on February 6th. If, instead, it strikes in the summer, when the beaches are full, those numbers could be off by a horrifying margin. • How much all this will cost is anyone’s guess; FEMA puts every number on its relief-and-recovery plan except a price. But whatever the ultimate figure—and even though U.S. taxpayers will cover seventy-five to a hundred per cent of the damage, as happens in declared disasters—the economy of the Pacific Northwest will collapse. Crippled by a lack of basic services, businesses will fail or move away. Many residents will flee as well. OSSPAC predicts a mass-displacement event and a long-term population downturn. • FEMA calculates that, across the region, something on the order of a million buildings—more than three thousand of them schools—will collapse or be compromised in the earthquake. So will half of all highway bridges, fifteen of the seventeen bridges spanning Portland’s two rivers, and two-thirds of railways and airports; also, one-third of all fire stations, half of all police stations, and two-thirds of all hospitals. WHICH brings us to an alert seen at Steve Quayle’s website in his SQ Alert section from July 17, 2015, which details a phone call received from a FEMA meeting attendee, someone generally not known as a “conspiracy theorist” and who considers them to be “nutjobs”……. at least he did until he attended the latest meeting. calls me a nutjob with too much time on my hands. I just got a phone call from him, he has been attending FEMA Training, and he is now having a meltdown after what they learned. -There is going to be an “Event” within the next 6 months. -The nature of the “Event” is believed to be a Natural Disaster, such as a Solar Flare, but could be something else. -The “Event” will be so catastrophic it will have a severe effect on our fragile economic infrastructure, so an interm bank holiday will be declared. -Social unrest and violence is expected due to the stores being emptied of food and other supplies, early after the event. So martial law is expected to be declared. -The “Event” is expected to make normal governing of the country extremely difficult if not impossible, so FEMA will be assuming continuity of government. -All involved and support personnel are required to maintain a supply of cash at home for emergencies, and a minimum of three days of food and water for each member of their families. This is not to get them through disaster, but to tide them over until FEMA can establish their Aid Camps. Is FEMA preparing for the “event” the scientists, researchers and FEMA representatives talk about in The New Yorker or are they actively preparing for something else? We all know the government has been preparing for “something.” We also know that multiple military training exercises that have occurred and are occurring right now, including Jade Helm which has been described by veterans as “unprecedented”, has military assets prepositioned across the country already. Could this be the reason for it all? June 2015 – ALABAMA - Early one morning last November, Jim Sterling was frightened when the ground began shaking outside his 156-year-old antebellum home in Alabama. He grabbed his gun and ran outdoors, where he found horses galloping, cows mooing and dogs barking. It was an earthquake. “I heard a boom and felt the shaking,” Sterling said. “It really upset me.” Since that day, more than a dozen weak earthquakes have shaken western Alabama's Greene County. Geologists are now working to find out what has caused this swarm over the last seven months, in an area of the South that's used to large tornadoes but not light tremors. “It is interesting that recently there has been more activity there than in the last four decades," said Sandy Ebersole, an earthquake expert with the Geological Survey of Alabama. Records from the U.S. Geological Survey show the first of 14 earthquakes occurred on Nov. 20, when a magnitude 3.8 earthquake was recorded about 10 miles northwest of the community of Eutaw. The second occurred in mid-December, followed by another in January and three within a few hours of each other on Feb. 19. 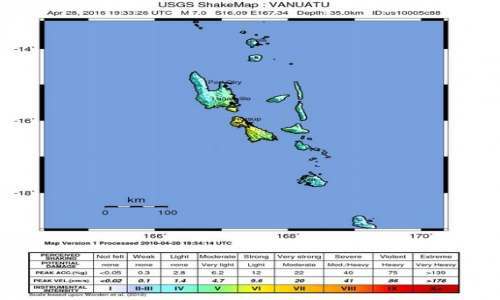 The tremors have continued ever since, with the most recent occurring June 6, when a magnitude 3.0 quake rattled the area. All the tremors have been weaker than the initial jolt in November, and Ebersole said some have been too slight for residents to detect. Located about 35 miles from Tuscaloosa, the whole of Greene County has only about 8,700 residents, and the area where the quakes are occurring is sparsely populated. Farmlands and forests are dotted by hunting preserves and old homes left over from Alabama's past as a cotton-producing, slave-holding state. Experts have installed a seismic monitor in a field to enable them to get better information about the quakes, none of which has caused major damage. Ebersole said researchers are trying to rule out potential causes such as blasting for quarries and sonic booms. They've even held meetings with rattled area residents. The earthquakes could be linked to underground cracks, or faults, found in the area in recent years at varying depths, Ebersole said. But just what has been causing the ground to shake is unclear. One potential source that regulators are discounting is hydraulic fracturing or “fracking,” a process for extracting underground oil or natural gas that has been blamed for earthquake swarms elsewhere, including Oklahoma. Wastewater is sometimes injected underground, a method the government has blamed for quakes. While Greene County is on the edge of Alabama's primary region for oil and gas production, state geologist Nick Tew said no such production or disposal work is going on in the area where the earthquakes are occurring. Hollywood has a long history of inserting political messages, social commentaries, subliminal effects and even cryptic warnings about the future into big budget films. So is someone attempting to use “San Andreas” to tell us something? For many years, doomsayers have been warning that the “Big One” is going to come along and rip the coastline of California to shreds. Up until this moment, it hasn’t happened, but without a doubt we have moved into a time of increased geological activity all over the globe. As you read this article, 42 volcanoes around the planet are currently erupting. That means that the number of volcanoes erupting right now is greater than the 20th century’s average for an entire year. In addition, we have been witnessing a great deal of very unusual earthquake activity lately. Just in the United States, we have seen unusual earthquakes hit Michigan, Texas, Mississippi, California, Idaho And Washington within the last month or so. Could it be possible that our planet has entered a period of heightened seismic activity? And could it also be possible that someone behind “San Andreas” is aware of this and is trying to warn us about what is coming in our future? And it is undeniable that California has been hit by an unusual number of earthquakes recently. Could this be a sign that our portion of the “Ring of Fire” is heating up? Just over the past few days, there have been significant earthquakes at dormant volcanoes all over the state of California and in Nevada. I don’t know about you, but to me all of this shaking is reason for concern. Garcetti has recently introduced a series of proposals called “Resilience by Design” to try to make sure the city’s buildings, telecommunications system and water supply are able to withstand a large earthquake. Emphasizing the challenges Los Angeles faces, the mayor noted how mobile phone service largely went down after the 1994 Northridge quake. And he said the water supply could also be challenged in the next big shaker, considering that the San Andreas Fault (depicted as causing the giant temblor in the Warner Bros.’ film) crosses the California Aqueduct in 20 places. And, unlike the film, the San Andreas can’t spawn tsunamis. So why is a giant tsunami in the film? Is it just there to make a summer disaster movie a little bit more spectacular, or is there something more to it? In the United States today, 39 percent of all Americans live in counties that directly border a shoreline, and there have been many that have been warning about the immense devastation that will happen when a giant tsunami hits either the east coast or the west coast. 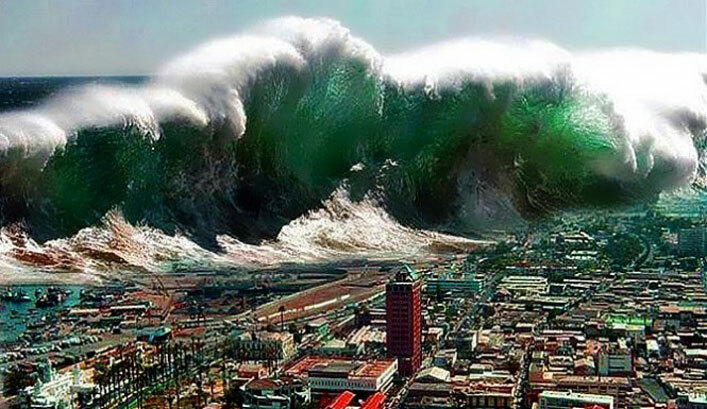 Could it be possible that the tsunami was in the film because someone believes that a giant tsunami is in our future? Very few filmmakers make movies purely for entertainment. Most of them want to “say something” through their films. So what is “San Andreas” saying to us? 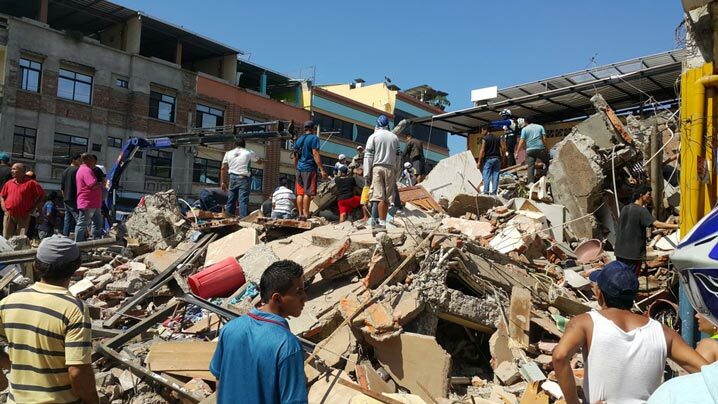 In a span of eight hours on Monday night and into early Tuesday, experts from the University of Costa Rica and the National University registered at least 23 temblors with epicenters located north of the province of Cartago, some 22 kilometers northeast of the Costa Rican capital. Ronny Quintero, a seismologist at UNA’s Volcanological and Seismological Observatory of Costa Rica (OVSICORI) reported that the temblors originated on local faults west of Irazú Volcano’s main crater. Experts said they are not directly related to the volcano’s activity. And all over the planet, volcanoes that have long been dormant are suddenly springing to life. After almost 33 years of inactivity, Wolf Volcano, the highest in the Galapagos Islands and home to the only population of pink iguanas in the world, began to erupt early Monday, the Galapagos National Park reported. “The volcano is not located near a populated area,” the Park said. “There is no risk for the human population.” The Galapagos Islands are located in the Pacific Ocean, some 1,000 kilometers off the coast of Ecuador. Pink iguanas share the habitat with yellow iguanas and giant tortoises, located on the northwest flank. The lava flow has southeasterly direction, so the park expects the animals won’t be affected. Our planet is becoming increasingly unstable. 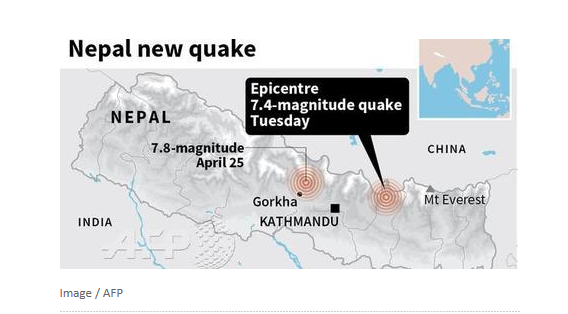 May 2015 – NEPAL - A major 7.3 magnitude earthquake has hit Nepal tonight, less than three weeks after a devastating quake left thousands dead and buildings ruined. The quake was originally designated as a 7.4 event, but it was later downgraded to a 7.3 magnitude quake by the USGS. Several buildings collapsed in the isolated town of Chautara, with at least four people killed, according to Paul Dillon, a spokesman with the International Organization for Migration. A rescue team from the agency has begun searching through the wreckage of the little town, he said. Chautara has become a hub for humanitarian aid in the wake of a major April 25 quake that killed more than 8,150 people and injured more than 17,860 as it flattened mountain villages and destroyed buildings. 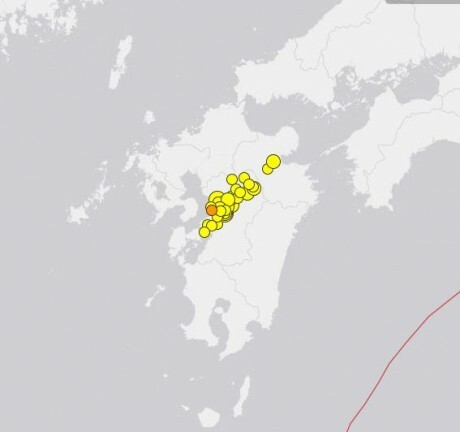 Tuesday's quake was deeper, however, coming from a depth of 18.5 kilometers (11.5 miles) versus the April 25th quake that hit 15 kilometers (9.3 miles). Aid agencies were still struggling Tuesday afternoon to get reports from outside of the capital. “We're thinking about children across the country, and who are already suffering. This could make them even more vulnerable,” Ms Foley said. In the capital of Kathmandu, the quake sent people rushing outside of their homes. 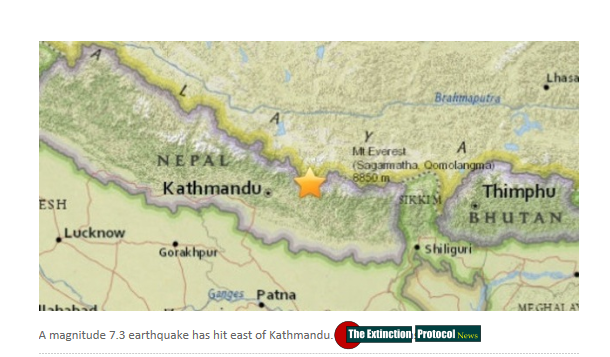 The tremors in Kathmandu lasted close to a minute according to an AFP correspondent in the city, with the ground swaying. Sirens could be heard soon afterwards and people were seen running screaming onto the streets of Kathmandu and nearby cities, while telephone connections were down. In the 10 year period between 1900 and 1909 our planet averaged 28.9 quakes of Magnitude 6 or larger. During the ten year period after that, between 1910 and 1919 our planet averaged 32. The biggest quake in 2014, was a magnitude 8.2, 94km NW of Iquique, Chile on the second of April. - March 11, 2011: A magnitude-9.0 earthquake off northeastern Japan causes a tsunami that sweeps onto the coast. About 19,000 people are killed and three nuclear reactors melt at the Fukushima Dai-ichi power plant. - Jan. 12, 2010: A 7.0 earthquake devastates Haiti’s capital and surrounding cities, killing 314,000 people. - May 12, 2008: A 7.9 temblor in China’s Sichuan province kills 87,000 people. A disproportionate number of them were children killed when their shoddily built schools collapsed. - Oct. 8, 2005: A 7.6 earthquake kills about 80,000 people in northwestern Pakistan and Kashmir. - Dec. 26, 2004: A 9.1 earthquake off western Indonesia triggers a tsunami in the Indian Ocean, killing 230,000 people in a dozen countries. - Dec. 26, 2003: A 6.6 earthquake flattens the historic city of Bam in southeastern Iran, and some 26,000 people are killed. Cascadia subduction zone that stretches from northern Vancouver Island to northern California can also produce a devastating Earthquake, that could kill thousands of people, like Japans 9.0 earthquake & trigger a large tsunami that would hit the USA west coast, Hawaii, & Islands of the Pacific. According to Geologists the Cascadia fault in the Pacific Northwest is locked up putting an enormous amount of pressure on the fault, meaning that a massive megathrust earthquake could occur at any time, seismologists are warning. 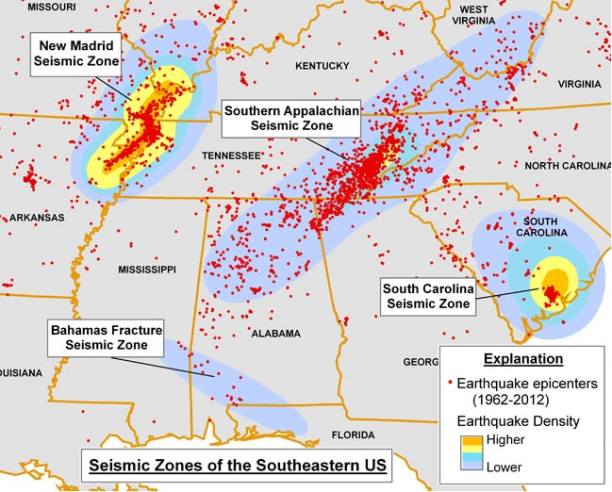 Earthquakes that occur in the New Madrid Seismic Zone potentially threaten parts of seven American states (Illinois, Indiana, Missouri,Arkansas, Kentucky, Tennessee and Mississippi) and could kill thousands of people. Earthquake magnitudes estimated to be as large as 8.0, all occurred within a three-month period between December 1811 and February 1812. The massive New Madrid earthquakes of 1811 and 1812 were strong enough to make the Mississippi River run backward. California according to Geologists is well overdue for a major earthquake! Are you ready for these signs of the times that Jesus & other prophets spoke about? If not, you can get ready now by receiving Jesus into your heart and studying His Word. In the video below by EarthshiftX we see USGS data in a New Madrid Seismic Update, along with evidence of "strong and rare" Earthquakes, as well as proof of some type of event is causing a massive increase in frequency of earthquakes of all magnitudes. The information provided in the video is literally shocking, but the comparison the videographer provides around the middle, which they claim is "jaw-dropping," will truly blow your mind. What EarthshiftX shows are two very simple searches, one for 1980 which shows a total of 16 earthquakes at magnitudes 1.0 - 3.0, then does a search for 2014 as a comparison, to which an error shows that states "The current selection includes 56875 earthquakes, which is more than is allowed." Warning from the details of the video "Expect weather extremes to increase more as we head into 2015, and watch Indonesia for quakes."